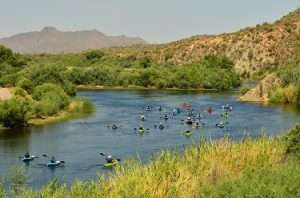 MESA, Ariz. — Arizona Game and Fish Department biologists and the local kayaking community are joining forces to battle an invasive snail that, left unchallenged, could negatively impact native snail populations, vegetation and fishing along the Lower Salt River. Last month a flotilla of more than 20 kayakers donned life jackets, grabbed their paddles and set off down the Lower Salt River northeast of Mesa looking for apple snail egg masses. A group of citizen scientists from Sea Life Arizona Aquarium will again join AZGFD and Tonto National Forest biologists on Friday, Aug. 11 to help count, smash and drown the bright pink egg sacks into the depths of the Lower Salt River. Adult apple snails can grow as large as golf balls. 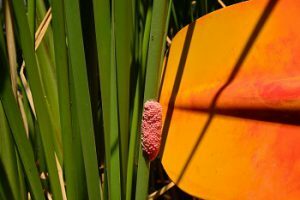 Females produce large egg sacks, which resemble pink bubble gum stuck to cattail stalks lining waterways, such as the Lower Salt River. Apple snails can lay a clutch of 25-500 eggs every 12 to 15 days. “Just one female apple snail can produce up to 15,000 offspring per year. That is why it’s important for us to engage the public, and our local kayaking and tubing communities to help battle this invasive species,” Sorensen said. Those wishing to join the battle against the invasive snail can simply smack the egg sacks into the water with a paddle or stick and the eggs will drown. However, use care when coming into contact with the snails as they are an intermediate host for the rat lungworm, which is a nematode that can cause meningitis in humans.